Loads of zucchini? Shred & freeze it to enjoy in winter meals. Subscribe to receive Free books & more from us! As autumn wind and rain denudes gardens of fleeting fall foliage, scrubby native snowberry (Symphoricarpos albus) begins to shine in the wild and in cultivated landscapes. Soon this snowberry hedgerow will be bare of leaves & the bright, white berries will take center stage. 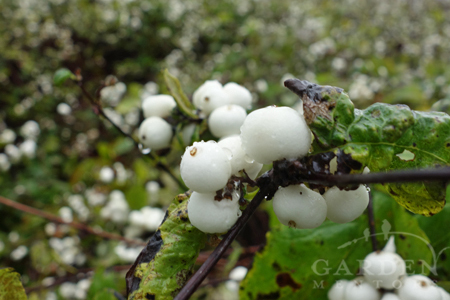 Snowberry is a scrubby, deciduous, North American native shrub that is adapted to a wide range of habitats. Growing to about three to five feet tall and wide, it thrives in dark understories as well as sunny roadsides. It plugs along steadily in damp or even dry soil. And, while its grey-green foliage may succumb to a bit of powdery mildew in the most stressful environments, it’s a tough shrub to kill through placement choices or neglect. Its diminutive pink flowers are favored by many wild bees whose pollination efforts lead to weighty clusters of fruit. To ensure those white winter berries really shine, give your shrubs an evergreen backdrop. Native mahonia, evergreen huckleberry or even a few sword ferns can do the trick in a shadier spot. If you’re gardening in the sun, consider mixing snowberry with wild, hippy roses — especially in a hedgerow, which offers protective habitat all year for wildlife. There are any number of summer blooming white wildflowers. Some are very distinct. Others may be difficult to differentiate. For instance, can you tell the difference between relatively innocuous and possibly edible Queen Anne’s lace (Daucus carota) and its terribly toxic Apiaceae cousins poison hemlock (Conicum maculatum) or giant hogweed (Heracleum mantegazzianum)? 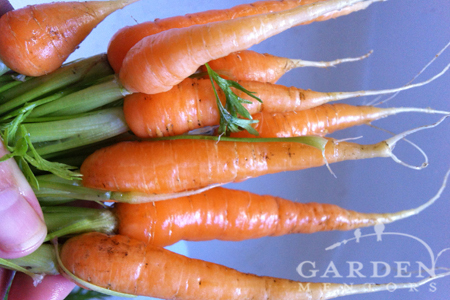 For that matter, can you tell the difference between these and their highly cultivated vegetable garden cousins the simple carrot or cilantro? Did you know that tasty cultivated carrots have some highly toxic cousins? If not, don’t despair! Even highly trained horticulturists may find themselves stumped by these similar looking plants. Just being aware that lookalikes exist and using caution when plucking wildflowers on a trail is a great first step! Just the other day I was strolling on a beach trail, thrilling to the sight of all the wildflowers in bloom. Delicate Queen Anne’s lace was one of the many. It’s a flower I’ve encountered all my life in wild settings from the Virginia countryside to the hillsides of northern California to the PacNW bay that I now call home. This non-native carrot family member has made itself at home throughout the United States — to the point of being declared noxious by many states. Noxious or not, the flowers of this beauty are a magnet for important pollinators that both feed and breed on it. 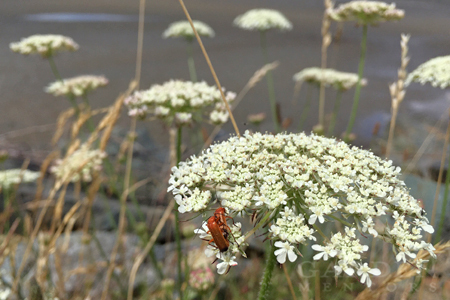 White wildflower Queen Anne’s lace may be considered noxious by some, but this non-native naturalized carrot family member is an important breeding ground for pollinators like these soldier beetles. Not far from the Queen Anne’s lace, and interspersed with it throughout the trail, were sprouts of its more dangerous cousins. The nearby towers of giant hogweed were past their bloom cycle and unlikely to confuse the toddlers plucking trail-side flowers. But, intermittent wispy sprouts of poison hemlock appeared to be masquerading among the profusion of Queen Anne’s lace — just waiting for an unsuspecting posy plucker to make a dangerous mistake. This is poison hemlock. 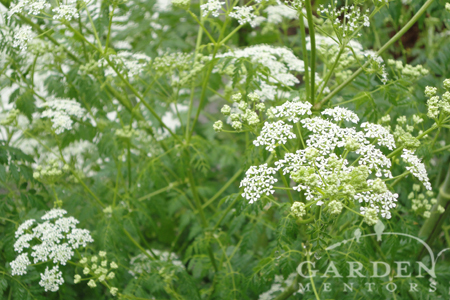 Like giant hogweed it is usually much larger than Queen Anne’s lace, cilantro and carrots. But, don’t count on that to keep you safe! Choosing the perfect ornamental grasses for your garden can be challenging for a number of reasons. In fact, while some plants may have the word grass in their name, they aren’t actually grasses. Instead, they may be sedges, rushes, lilies or any number of other non-grass plants. And, while there’s a grass or grass-like plant to fit just about any environmental garden challenge, determining the right one for your spot may be overwhelming. Black mondo grass (Ophiopogon planiscapus ‘Nigrescens’) is actually more closely related to asparagus! 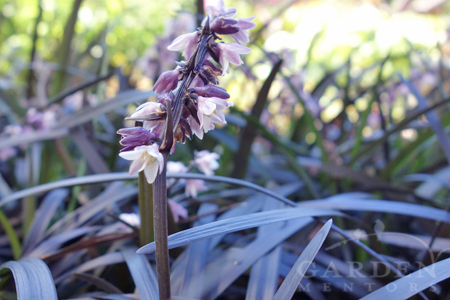 It has the fun texture of ornamental grasses & unique black coloration, but it isn’t a grass. It spreads slowly in the garden & tends to play nice with others. The showy flowers are a big hint that it isn’t a true grass. 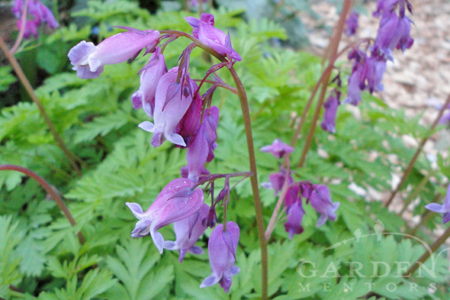 In early spring, bleeding hearts are among some of the earliest perennials to bloom. They blend beautifully into mixed, slightly shady borders. This plant isn’t a fan of lots of hot sunshine, and even in a protected spot, its top growth may fade in summer’s heat. But, don’t worry, it’ll be back next year. Just be sure your design incorporates a few evergreens or longer-season perennials nearby to give your garden interest at other times of year. Dicentra spectablis ‘Alba’ is a white flowered cultivar that’s spectacular – true to the species name! Want a native bleeding heart? 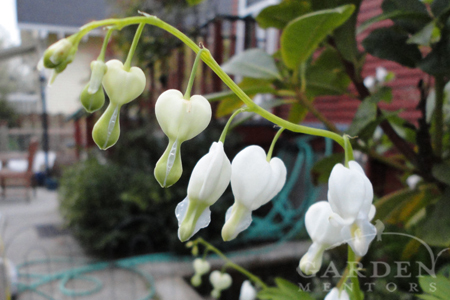 Dicentra formosa, or fern-leaf bleeding heart, is native to the Pacific coast — where we live. It thrives in Seattle gardens, so much so that some consider it weedy. This little perennial will naturalize (aka spread) in garden beds, but it plays well with others. Plant it in a mixed woodland shade border with deer fern, evergreen huckleberry and trillium for great early spring effect. When summer’s heat kicks into gear, this little plant’s ferny foliage will begin to yellow and fade for the season. Dicentra ‘Burning Hearts’ has a compact form with sea-foam green foliage that’s somewhat fern shaped. If you need to brighten up your shade garden, choose Dicentra ‘Gold Heart.’ This version of the spectablis forms has golden leaves and stems, paired with traditional dripping pink blooms. 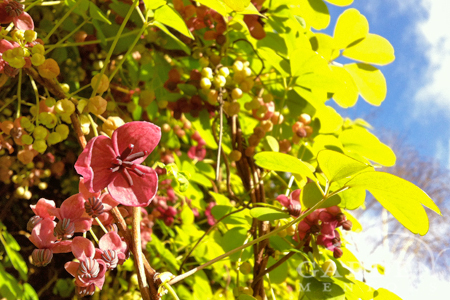 One of our favorite vines for PacNW gardens is Akebia quinata, also commonly known as the chocolate vine or vanilla vine. This beautiful, hardy plant won’t serve up your favorite ice cream flavors, but does provide solutions to a number of garden challenges. Plus, when it blooms, it fills the garden with tasty scents — more like nutmeg than chocolate or vanilla to our olfactory senses, but hey, that’s sweet too! And, it might just offer up some sugary-sweet fruit as well. 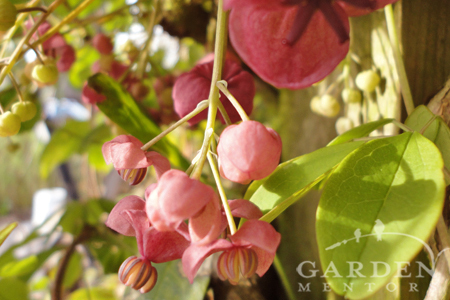 Akebia quinata flowers form in grape-like clusters, dripping from a tall arbor in early spring. 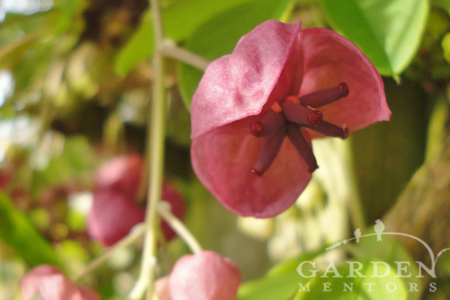 This plant is a great climber for sunny or shady spots. Not only will it tolerate shade, but it will bloom beautifully in even darker garden corners. For your darkest nooks, Akebia ‘Alba’ might be your better choice as the lemony-white blooms will help brighten things up. 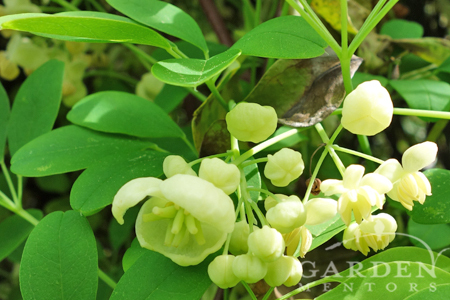 Akebia ‘Alba’ can brighten up darker corners in the garden. This vine is (mostly) evergreen in the PacNW. If you’re relying on it for privacy, be forewarned that cold snaps can defoliate it — partially or even completely — in winter. And, if the cold snap hits in late winter/early spring, it may put a damper on the blooms that break forth as early as February. But, it’s tough to keep a good vine down! Even if the cold knocks it back, it’s unlikely an established plant will completely die off. Most just lose a few buds and bounce back fast. The larger bloom in each Akebia flower cluster is a female, which is what will potentially become edible fruit. 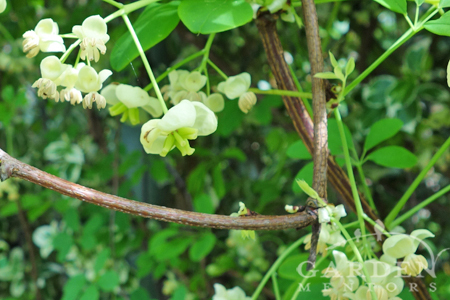 Akebia climbs by twining, so except for training, you probably won’t need to tie it to your climbing structure. Those succulent, winding stems will later take a woody form that fattens up into stiff, hard stems and trunks — like a shrub or tree. And, they will wrap around themselves and anything else they encounter, so plan to prune it regularly, and be on the lookout for tendrils making their way into nearby trees. As Akebia stems mature, they become woody. Cut those babies out while they’re young and small, or you’ll be in for a tough job with a saw. If vines form into dense thickets when interior stems are overgrown by new growth, songbirds may use those spots for cover or nesting locations. Larger birds, like crows, may harvest older dead wood to use in their nests. Akebia forms clusters of flowers. Here, many male flowers dangle below the larger female bloom. And, while it won’t taste like a vanilla shake or chocolate cake, Akebia does sometimes produce an edible fruit. Fruit is formed on the female flowers of the purple Akebia quinata. The white Akebia, however, is more likely to be sterile. So, if eating sugary-sweet, gelatinous fruit wrapped in a casing reminiscent of a hard sunglasses case isn’t your thing, plant Akebia quinata ‘Alba’ instead of the purple. That being said, in the decade we’ve grown Akebia, our voracious vine has only produced fruit once, and the squirrels ate most of it.